I’m not sure why,1 but in many cultures around the world,2 drums are often either forbidden to women or considered somehow an un-feminine instrument that girls shouldn’t or can’t play. Maybe that’s why I’ve got a bit of a soft spot for female drummers; it’s awesome to see other people achieving things that I and so many other women have been denied. 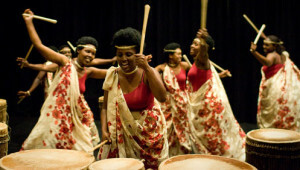 Ingoma Nshya is a drumming group made up of Rwandan women from both Hutu and Tutsi ethnic groups, groups that have been on the opposite sides of war and genocide.3 The twenty women in the group come from low-income backgrounds, and have often endured horrible events in their personal lives. 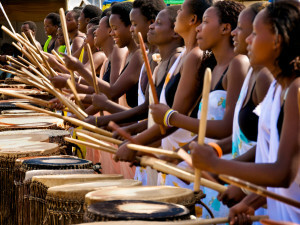 Traditionally, only men are allowed to play drums in Rwandan culture, and the group has experienced some pushback from male drummers and other members of the community since their founding in 2004. But that hasn’t stopped them from moving forward, performing around the world and building bridges in their community as well as others. When you watch them perform, though, you don’t see victims of war or culture differences; you see pure joy, incredible skill, and breath-taking artistry. Ingoma Nshya is a dynamic, beautiful and highly skilled group of drummers who perform like consummate professionals. The rhythms make my heart pound and the blood rush in my veins, and the showmanship of the performance is inspiring and uplifting. 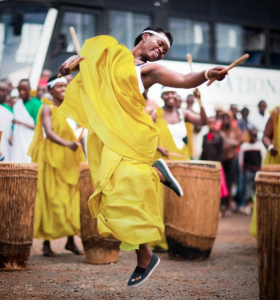 Without knowing anything about their story or culture, the music pulls you in, filling you with joy and admiration for the mastery of the performance. Sometimes there’s a rock’n’roll swagger, or a grace and beauty – the performances vary widely – but always performed with the sort of pleasure that lights me up when I see it. Music should be a pleasure to perform, and I love seeing bands that obviously love what they’re doing. The band doesn’t seem to have a website,4 but there’s some terrific video online and a recently-released documentary film about their partnership with an ice cream company – the doc is called Sweet Dreams, and I’m going to make a point of seeing it in the future. I’m going to embed three videos: the first is a trailer for the Sweet Dreams documentary; the second 10-minute documentary-style work with Spanish subtitles, which primarily shows the group in rehearsal;5 the third is a performance. All three are well-worth a watch, tho the last 2 mins of the mini-documentary are where you want to go if you want to see that swagger roll out at you from your computer screen. Dear Ontario presenters: I would loooooove to see this band live. Wouldn’t you?